The temperatures in Dallas are already beginning to reach the 60s, and if one of your new year’s resolutions was to spend more time outdoors, you may have already considered new patio installation for your home. Outdoor living is a trend that is becoming much more popular, especially in regions such as Dallas-Fort Worth, where the temperature is typically mild. And, with quality outdoor living space design, you will be provided with a space for entertaining, dining, relaxing, or simply enjoying the outdoors more. Outdoor living spaces can be constructed with a variety of materials, so it is important to choose an option that is a good fit for your home. A patio design company in Dallas can provide you with a terrific range of ideas for your outdoor living space, helping you create an area that is best suited for your home and your lifestyle. 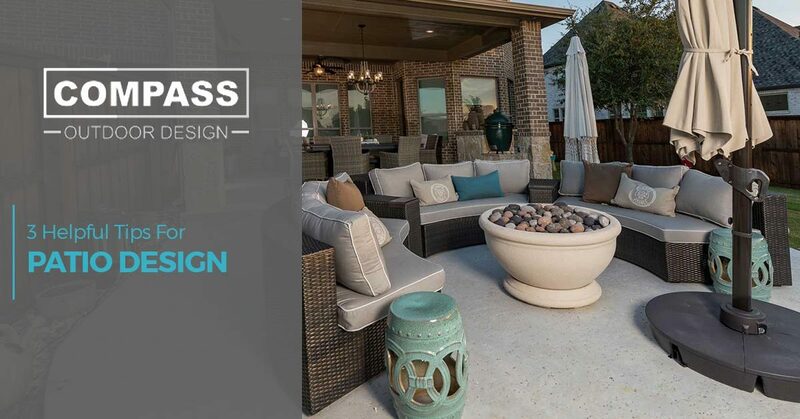 If you are interested in transforming your backyard with professional patio design in Dallas, Compass Outdoor Design is your premier choice. Our team works with you every step of the way to design and build something that fits your style, your needs, and budget. To help you get ready for your new patio installation, here is a look at some tips for designing your new patio. When you are considering a new patio, it is important to think about the available space and how it will be used. For instance, your outdoor living space can be designed to accommodate large groups of people or smaller, more intimate crowds. When you consider how your space will be used, you will be able to create a custom patio that you will be sure to get extended use out of over the years to come. Today, patios are much more than a concreted area with some cheap patio furniture. The designs and features you can include are seemingly endless. Whether you want a spacious outdoor kitchen, a pergola that keeps you cool during the summer, an outdoor fireplace to keep cozy at night, or another outdoor living space feature, our team can help you design and build the patio of your dreams. New patios can be constructed with a variety of materials, so it’s important to choose materials that are best suited for your home and lifestyle. In addition to the material of the patio surface, you may also have to select materials for outdoor kitchen countertops and any other additional features that you want to add. When you are selecting materials for your outdoor living space, it is important to select those that are not only weather resistant, but also attractive to the eye. These three tips will help you begin the patio design process. Of course, there is much more decision-making and considerations involved in the outdoor living design process. That’s where our patio design company comes into play. Our team specializes in designing outdoor living spaces to fit your style, wants, needs, and budget. To learn more information or request a consultation, contact our experienced patio designers today.